The Backupper submenus are not accessible, please see screenshot. 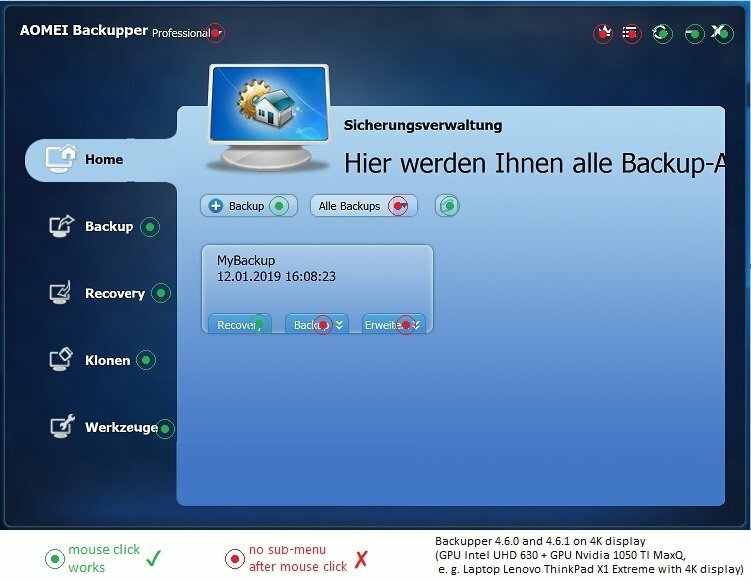 The Backupper (or Backupper Professional) application runs on a fresh Windows installation, no other software is installed, and all drivers are up to date (2019/01/12). Following changes do not solve the problem: changing the Windows screen resolution, changing the Windows screen scaling factor, changing the BIOS display configuration, changing between activation of CPU-internal graphic card and discrete graphic card. This work-around does work: After each mouse click, press the "Print"-key. After using the Backupper application also all other Windows applications have this problem. This disappears only after a Windows sign out or Windows restart. For the text display bug, visible in this screenshot, see https://www.aomeitech.com/forum/discussion/5753/ui-bug-on-hidpi-screen/p1.